These people are so unimaginably stupid. Trump acolytes spend so much of their time trying to influence public opinion to stave off the impeachment of Dear Leader (since impeachment is a political question, not a legal one), that they forget that there is an entire legal system that exists and is very interested in what these people are saying and doing. In court, it was revealed that Michael Cohen has three clients, two of which are Sean Hannity and Donald Trump. Thursday night, Sean Hannity went on TV to reveal details of conversations he had with Cohen, who is currently being turned inside out by the Southern District of New York, special counsel Robert Mueller and the United States House of Representatives. If Sean Hannity doesn't understand that he volunteered himself for questioning with all those folks through this provable lie, then he doesn't even have the legal knowledge you can get from watching one episode of Law and Order. Even if Hannity is telling the truth, this still isn't great news for him. The best way to avoid getting busted by the Feds is to never ever talk to the Feds, and now Hannity has guaranteed himself time in a room with investigators who will surely want to test the limits on how much he knows about what Michael Cohen and Donald Trump know. 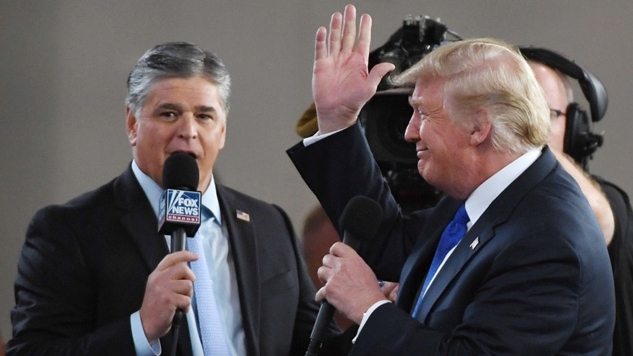 After all, Hannity said it himself: he spoke about potentially criminal matters directly related to the president with a man who pleaded guilty to crimes done “at the direction of the president.” Investigators would be abdicating their sworn duty to not investigate Hannity's claims. These people are so incredibly stupid. However, there is a darker side to this brazen lunacy. We know that the Sean Hannitys of the world are putting up this smokescreen in order to guard Dear Leader from scrutiny, because Rudy Giuliani even said that this will eventually become a question of impeachment. But if we keep running into the same issue over and over and over again—where these folks do something unimaginably stupid and personally damaging to their legal standing—perhaps stupidity isn't the best explanation for what's going on. Perhaps it's something more nefarious. There's no question that the president views the Department of Justice and the Federal Bureau of Investigation as tools for his personal use. Trump truly does not understand that there is a separation of powers within the executive branch, but Hannity has been around long enough to know this very basic constitutional fact that even children can wrap their heads around. So has Rudy Giuliani. These guys aren't mental giants, but you don't hang around this long while being completely misinformed as to how the world works. Maybe, these people wrapped up in Trump's mess are counting* on Trump's authoritarian instincts to overrule the rule of law in instances where they may have broken the law. *My editor Shane Ryan made a good point after I submitted this: one look at the present state of guys like Michael Cohen or Steve Bannon proves that counting on Trump's loyalty is a fool's errand—which even brings the nefarious angle full-circle to stupidity. Hannity's one saving grace may be if Twitter personality, kilgore trout's conspiracy theory about Hannity being wrapped up in the Wikileaks portion of this mess with Don Jr. is true—a fairly convincing theory he advanced before Hannity got kicked off Twitter and Wikileaks' Julian Assange direct messaged a fake Hannity account that emerged, referencing a previous conversation between the two. Maybe Hannity is exposing himself legally here because he's not worried about federal investigators, and he thinks that the House Dems bringing him in would be a victory for his propagandistic cause. Maybe he has received assurances from Trump that he doesn't need to worry about any legal exposure. Maybe new AG Bill Barr had to agree to those assurances in his interviews with Trump. It's a well-known fact that Sean Hannity is a de facto senior advisor to the president, so it would be naïve to think that he has no power within the government. And while SDNY is constitutionally out of reach for Trump, they still report to Trump's Attorney General. They're not charging Trump without Bill Barr's approval, and that's why reports yesterday from Chris Christie that SDNY is “trying” to indict Trump are literally unbelievable. That's not how this works. That's not how any of this works. These people are so exceptionally stupid, but they are also immeasurably craven too. When I put on my political science cap to try assess the situation, the most likely scenario that comes out of this is that not only is Sean Hannity a dimwit who has hurt his own legal standing by being a bloviating buffoon, but that he also doesn’t care because our criminal president has given him assurances that he will not have to answer for any potential crimes, including this clear lie about a former Trump employee who just gave a pretty damning congressional testimony about President Trump.